Colt's pretty much the Onion Ring connoisseur around our house. Whenever we go out to eat if Onion Rings are on the menu he's ordering them. So I know when he says these are the best, he knows what he's talking about. 1. It's all about the light and crunchy seasoned coating- this is accomplished using panko bread crumbs. 2. 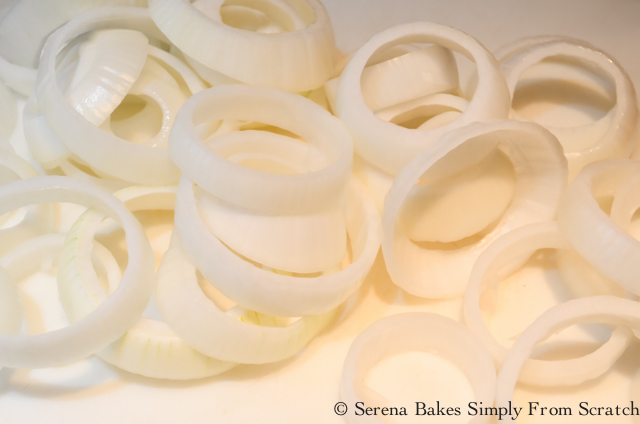 Nice thick slices of sweet white onion- we find Walla Walla or Vidalia Onions perfect for this. 3. Not overly greasy in a heavy soggy shell - two huge pet peeves when ordering Onion Rings. I have to agree with him on all these points. There's really only 1 other place in our area that even come close to these little mouthfuls of heaven, making it well worth the effort to make Homemade Onion Rings! Preheat oven to 250 degrees and slice 2-3 large Onions about 3/4"-1" thick. In a large bowl combine 2 cups All-Purpose Flour, 1 tablespoon Granulated Garlic, 1 teaspoon Salt, and 1 teaspoon Black Pepper. 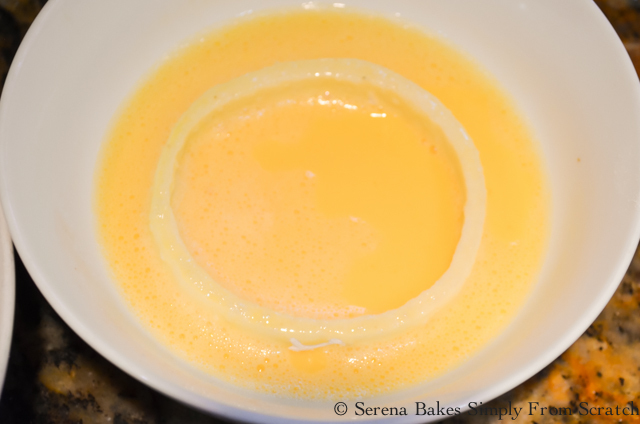 In another bowl whisk together 3 whole Eggs and 1/3 cup Water. 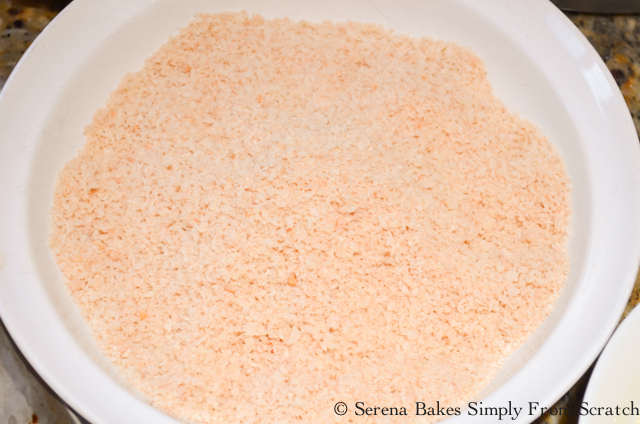 In a 3rd large bowl combine 2 cups Panko Bread Crumbs, 1 teaspoon Salt, and 1 teaspoon Smoked Paprika. 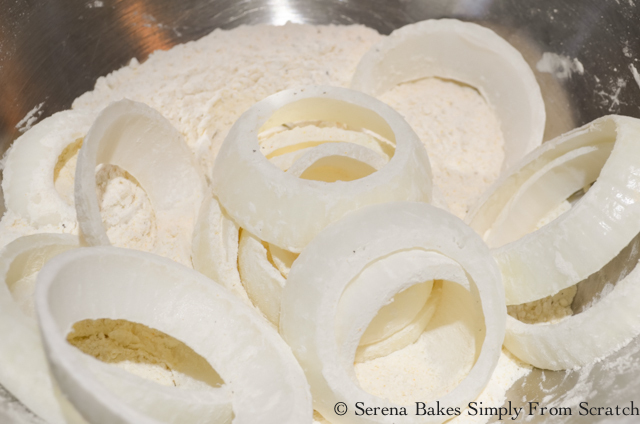 Toss onion rings into seasoned flour mixture. Then dip into egg mixture, back into the flour mixture, then back into the egg. This makes a nice sticky coating for the panko to adhere to. 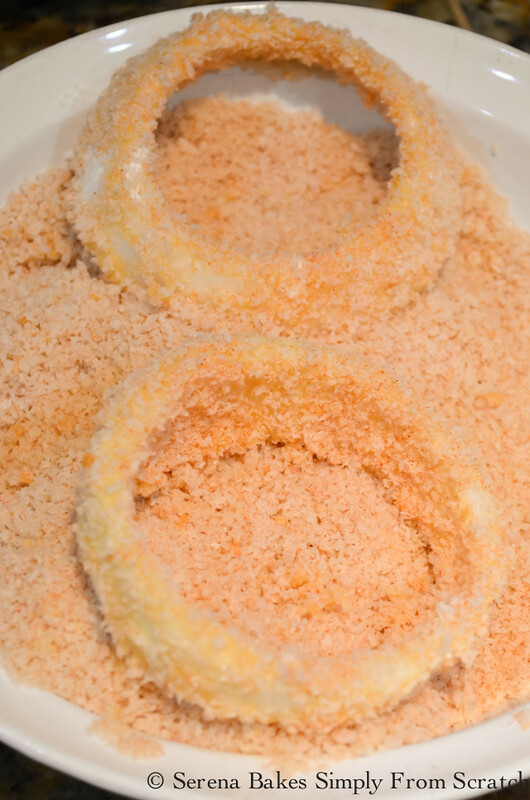 Dip into the seasoned panko bread crumbs and cover all sides. Using a candy or frying thermometer attached to the side of a heavy duty skillet add 1 1/2" Vegetable Oil or favorite high heat cooking oil. Heat to 350 degrees. Add a single layer of onion rings and turn once golden golden brown. Once both sides are golden brown. 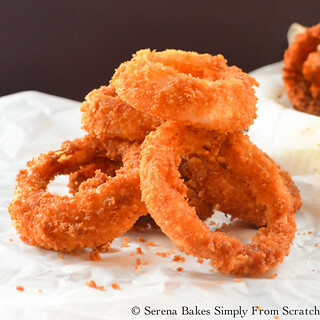 Place onion rings on a paper towel lined baking sheet and keep warm in a 250 degree oven. Repeat with remaining onion rings until done. 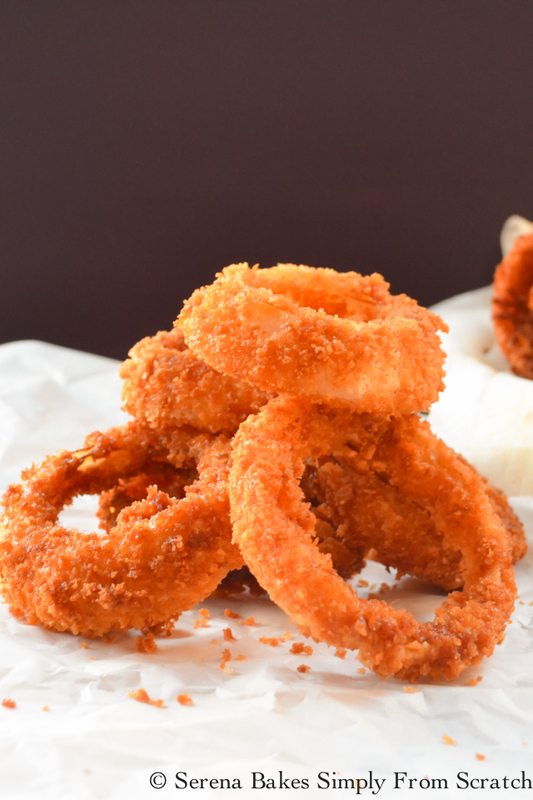 Light and crispy onion rings served with tartar sauce or fry sauce, it doesn't get better then this! 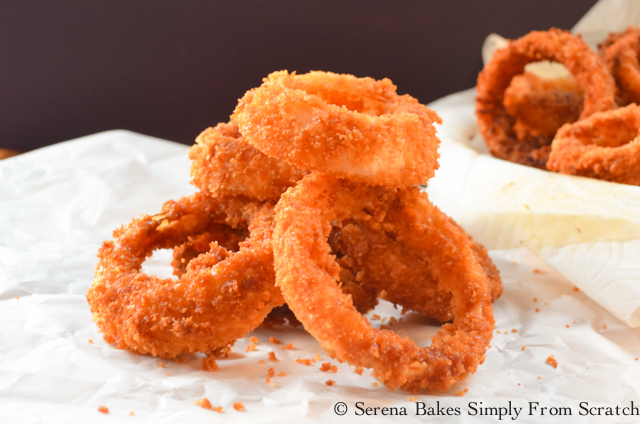 Light and crunchy onion rings with easy to follow step by step instructions. Preheat oven to 250 degrees. Line 2 cookie sheets with paper towels and set aside. In a heavy duty skillet attach a candy or frying thermometer add about 1 1/2" of cooking oil to skillet and heat to 350 degrees. 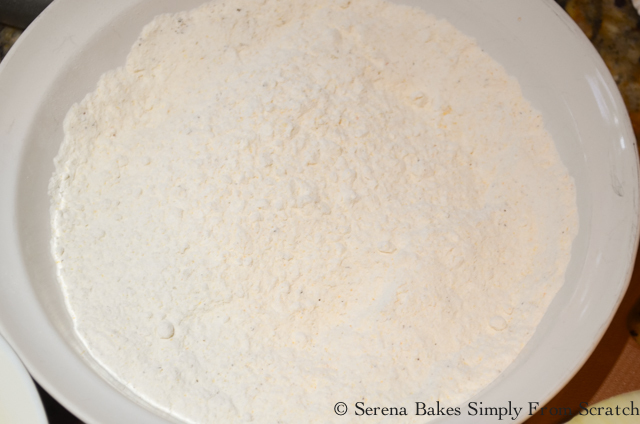 In a large bowl add flour, granulated garlic, 1 teaspoon salt, and pepper. Stir until well combined. Set aside. 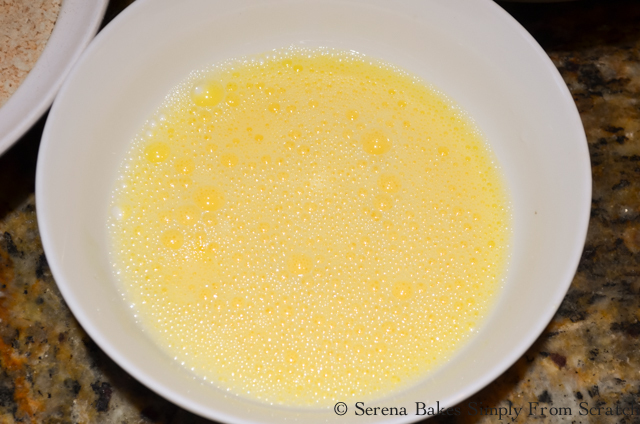 In another bowl whisk together eggs and water. Set aside. In a third bowl add panko bread crumbs, 2 teaspoon salt, and smoked paprika. Stir until well combined. Working in small batches coat onion rings in flour mixture and then dip into egg mixture. Dip back into flour, and then egg. Place into panko bread crumbs and coat well on all sides. 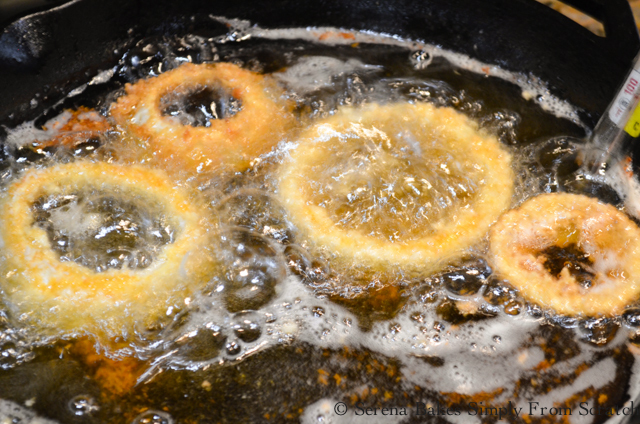 Add onions rings to hot oil. 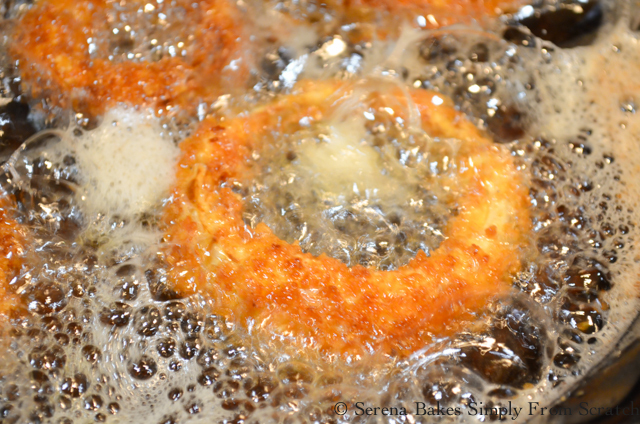 Turn onion rings once golden brown. Once golden brown move to baking sheets and keep warm in oven. Repeat with remaining Onion Rings.